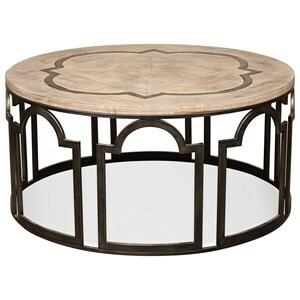 Make a big style impact with just one accent piece when you add this contemporary chairside table to your living space. With the way its geometric, metal base and decorative metal inlay balance curving and sharp edges, the design will catch your attention. Plus, you get to reap the benefits of having extra, mobile table space while enjoying the fact that the table top is made from reclaimed wood. 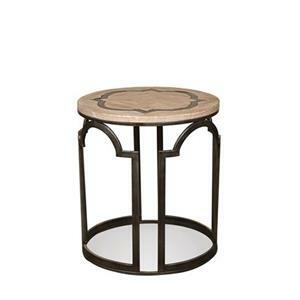 The Estelle Contemporary Rustic Round Chairside Table with Reclaimed Wood Top by Riverside Furniture at Belfort Furniture in the Washington DC, Northern Virginia, Maryland and Fairfax VA area. Product availability may vary. Contact us for the most current availability on this product. This collection of occasional tables is stylish in a way you can feel good about thanks to the tables' reclaimed wood tops. Their geometric metal bases and decorative metal inlays provide eye-catching, contemporary design elements as well, while their distressed finishes provide rustic charm, giving you extra table space plus plenty of visual appeal. The Estelle collection is a great option if you are looking for Rustic Contemporary furniture in the Washington DC, Northern Virginia, Maryland and Fairfax VA area. Browse other items in the Estelle collection from Belfort Furniture in the Washington DC, Northern Virginia, Maryland and Fairfax VA area.